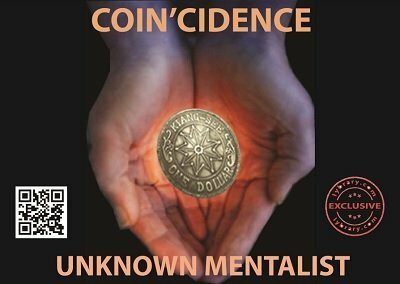 The owners of this ebook can get Absolute and Ultimate Coin'cidence for half price. This is a routine which defies categorization. It is inexplicably weird and amazingly powerful. It can be performed with your own coins or borrowed coins. With your own business cards or borrowed business cards. It can be performed with real coins or even with imaginary coins. The performer makes a prediction on the back of his business card and keeps it face down in full view right before commencing the routine. A participant is asked to make a free choice from among 5 coins, real or imaginary. After the participant lands on a coin, the prediction is turned over and it matches the participant choice exactly. And the performer ends up giving a stunning souvenir to the participant which she will treasure as a lucky talisman and will be cherish it for a long time. This is completely self working. No sleights, no pre show, no stooges, no electronics, no dual reality, no verbal manipulation, no multiple outs, no equivoque, an impromptu anytime-anywhere routine which can also be done totally prop less (if you do not consider business cards or pens as props). Although a variation each is given which uses basic equivoque in one and a basic multiple out in another, the main routine does not need either. This routine can also be looked at as a 5-coin, no equivoque, self working version of Max Maven's Positive/Negative. Only, instead of the heads or tails option, here the participant is given 5 possible choices, which increases the odds multifold. There are 250 possible outcomes and your prediction hits 100% exact. A bonus routine is also explained where the 5 coins can all be different and the final prediction also includes this choice. It can be performed as an independent routine by itself or as a killer addition to any other coin routine or bill routine. It can be used as a great opener or an equally great closer to any close up act. Or can be just performed as a stand alone effect. But the maximum impact is in a one on one situation. This can become another highlight in any coin worker's act. It is also invitingly easy for non-coin workers. In fact, it is especially tempting for mentalists. It is a versatile routine. It can be used as a pure mentalism routine or as a coin routine or even as a mental magic routine. You will do this every day to every new person you meet. Guaranteed. This is coin mentalism. This is Coin'cidence . 1st edition 2016, 22 pages (including illustrations and photos). Coin'cidence is a great trick. I like to use it with 5 imaginary coins as the original routine. This effect didn't impress me that much in the beginning BUT, the effect it has on spectators is astounding! I think that sometimes we focus too much on the methodology that we are going to use as performers when we should be trying out the effect and see the impact on the audience. I can wait till a couple of weeks from now when I buy the 2 ebook bundle for this routine. Again, another great job Unknown Mentalist. Coin'cidence, Absolute Coin'cidence & Ultimate Coin'cidence - got this 3 ebook bundle for $27 (I missed the intro offer of $15). Brilliant principles and clever methods. 27 routines in all. Extraordinary range of pocket mentalism using business cards. The author's take on Max Maven's positive/negative is unconventional and killer. For me just this one is worth the cost of the bundle. On the same day I completed reading, could perform it thrice with great success(using invisible coins!). Simple and stunning. I will be using a lot of these routines. Highly recommended. Over-priced in my opinion. Not as clean as the description. No bad, but I wont use it. This is my second purchase of this author and must say I am doubly impressed. This is just too good and I see myself showing it off almost everyday. I found this a highly creative routine. Real pleasure to perform. Fantastic reactions. Both the main routine and bonus routine are true workers. Especially the bonus is a big leap forward from the Positive/Negative premise. The climax peaks excellently. Very much recommended. WOW ! Absolutely killer. Simple great idea, but very powerful. Anytime, fully impromtu. 5 times in 5 hours, successful performance. Works in any language.